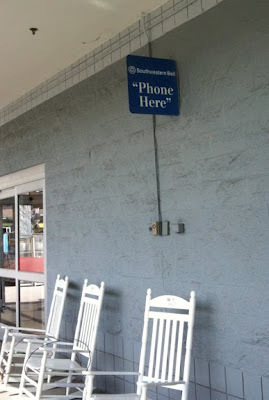 The “Blog” of “Unnecessary” Quotation Marks: pretend there is a phone here! Stephanie notes that either the quotation marks make sense because there is no phone, or you are supposed to use your cell phone there and nowhere else (which is also weird). It's like a new version of Marco Polo. "Phone where?" "Phone here!" Could be a request to put a phone here! Or, could it be a memo to Southwestern bell next time they're in the area. The business therein wants to hear from them. Hey, E.T. is from there! the sign is obviously a "phony"
that's for the deaf elders.